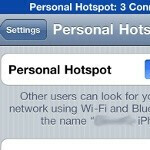 AT&T to launch Personal Hotspot with iOS 4.3? Verizon iPhone 4 owners have been lucky when it comes to wireless tethering as the Personal Hotspot feature is exclusive to iPhone 4 owners on Big Red's network. AT&T, however, might be preparing to launch Personal Hotspot for its users as well. The carrier reportedly agreed to provisioning the feature for iOS 4.3 beta 3 for a developer. The update will be made publicly available with iOS 4.3, which is rumored to come out at the end of the month. The feature might put even more pressure on AT&T's network as it allows for up to 5 devices to wirelessly tether to the iPhone. Currently, Verizon charges an extra $20 a month for Wi-Fi tethering and AT&T will probably introduce a fee as well. In comparison, users who chose to jailbreak their iPhone have the option to use the MyWi app, which mimics the Personal Hotspot functionality and comes at a one-time charge of $20. In this case AT&T really has not control in the matter. Its up to Apple to decide if hotspot will or will not be included. Otherwise Apple will take its ball and go play somewhere else, maybe at Verizon's house or T-Mobile Trailer or Sprints Shanty. All in All Apple has a should control on its product and its not up to AT&T to decide what the product carries. Also since AT&T has a slew on Apps on the iPhone does it also have to pay Apple 30% of its profits? The hotspot function is confirmed by it's existence in all versions of the beta. Att is not confirming it. Simply confirming they will support it. It's not about control. Also att's apps are free. So no they don't have to pay 30%. Then again, no developer has to pay 30%, it's taken out of revenue from the apps which is paid directly to apple. Then the remaining 70% is then paid by apple to the dev monthly. Only thing att would have had to pay would be the $100 to join apples dev community. Then again it may be in their contract that they can freely make apps. Then again it is just $100 bucks. Yeah, but AT*T charges a subscription/monthly fee to be on AT&T's network. Which AT*T and would have to offer through its Apps. Meaning Apple would want a cut. You couldn't think of a better way to troll? Cell service is not something that can be sold through an app. You need to buy it with the phone. Ben though you can alter through the app it isn't selling it. They're exempt. what are you talking about can't be sold through an App? Ipad cell service is essential sold through an App. And its subscription based. It not sold through a thIrd party app. The subscription and in app purchase rules apply to third party apps. iPad 3G service is activated through settings. That's a first party app. And yeah it's apple making a difference. They do make exceptions for their own apps because they are responsible for the stability of the OS. Forget the hotspot. Without unlimited data it won't really matter. When is AT&T going to offer Unlimited Data Plans back. So true, you can really run up a phone bill if you're going to tether other devices. 5GB is not enough unless you're a casual data user, which is rare nowadays. Unlimited dat doesn't matter much either because even verizon doesnt offer unlimited when it comes to hotspot tethering. ATT already offers Wi-Fi hotspot with the release of the Inspire 4G. Data plan is $45 for 4GB with tethering...aka tethering is the hotspot feature. Due to the iPhone being carrier locked the feature will not work if you do not have the tethering feature on the account. Like I wish I could tell our many unlimited data subscribers, just jailbreak your phone, keep unlimited data for $30 and do whatever you want with it. I would only care for this feature if it's free. And it should. Otherwise, I see this as just another way for carriers to make more money. $20/month? Ridiculous.